Did you know that wine produced from the regions around Cape Town is considered as some of the best in the world? If you’re a wine lover and find yourself in the Mother City, there’s no excuse not to sample some of the area’s award-winning wines. With City Sightseeing you don’t even have to worry about driving or researching which winery you want to visit – let us do the work while you sit back and enjoy the drive through the vineyards. City Sightseeing offers two wine tours that visit some of the top wine areas in South Africa. With the Constantia Wine Valley Bus, you have the freedom to do some sightseeing and enjoy the views from the open-top bus after visiting three wine farms – including Groot Constantia, South Africa’s oldest wine estate. Our second offering is a full-day, live-guided tour to the Franschhoek and Stellenbosch winelands – two of the country’s most picturesque areas. What makes this tour different is that it is not a hop-on, hop-off trip like our open-top tours. Instead, you’ll be travelling in a luxury air-conditioned coach with a set itinerary, accompanied by a knowledgeable guide. 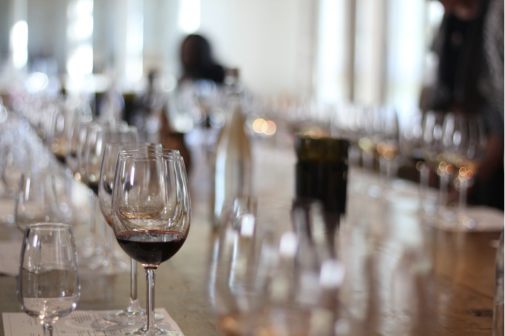 The tour also includes two wine tastings, a cheese pairing and a cellar tour. Tick off wine-related items on your bucket list (or fill the bucket with award-winning wine!) with City Sightseeing and experience the best that the Cape Winelands can offer. What to know about the Constantia Wine Valley Bus The circular Constantia Wine Valley Bus route has stops at three leading wine estates. To join the wine tour, hop on the Mini Peninsula Tour and hop off at Constantia Nek. The Constantia Wine Valley Bus will pick you up at this stop. The bus will stop at Groot Constantia, Eagles’ Nest and Beau Constantia at 20-minute intervals, allowing you to enjoy a wine tasting, lunch or a tour of the properties at your leisure. To return to Cape Town, simply hop back on the Mini Peninsula Tour at your starting point at Constantia Nek, sit back, relax and enjoy the scenic drive along the coast. Please note that the tour price does not include wine tastings. The full-day, live-guided tour to the Cape Winelands is one of City Sightseeing’s premier offerings. Not only does your ticket include two wine tastings at estates in Franschhoek and Stellenbosch, but also a cheese pairing and cellar tour. You will get a chance to see the famous, heart-warming Vergenoegd Wine Estate parade of over a thousand ducks waddling past on their way to the vineyards, where they gobble up snails in a natural pest-control effort, plus a postcard photo opportunity at Bloubergstrand, offering some of the peninsula’s best views of Table Mountain. At midday, the tour will stop for two hours in the quaint village of Franschhoek, where you can either enjoy a leisurely lunch at one of the local eateries, or cram in an extra wine tasting. Please note that this is not included in the ticket. To tour departs at select stops in Cape Town to pick up the day’s passengers and returns again in the afternoon around 5.30pm.